Is there a signature dish you’ve never quite dared to prepare? Beef Wellington, perhaps, or a delicious soufflé? Now is your time, with the new Wolf 762mm M series built-in double oven. It takes the guesswork out of even the most difficult dishes. Just dial in any of 10 precision cooking modes and the oven delivers the optimal heat and airflow for the dish. No hot or cold spots to spoil your results. Just beautifully browned roast chicken, perfect chocolate chip cookies, crisply crusted casserole. You’re in culinary heaven. Wolf’s Dual VertiCross™ system is their most advanced dual convection ever, quickly saturating the oven cavity with consistent heat across all racks. The cooking modes are precise and intuitive, to ensure that the meal you bring to the table is every bit as delicious as the meal you had in mind. A Gourmet feature has a menu of presets that automatically controls the cooking, making commonly prepared meals quick and easy. 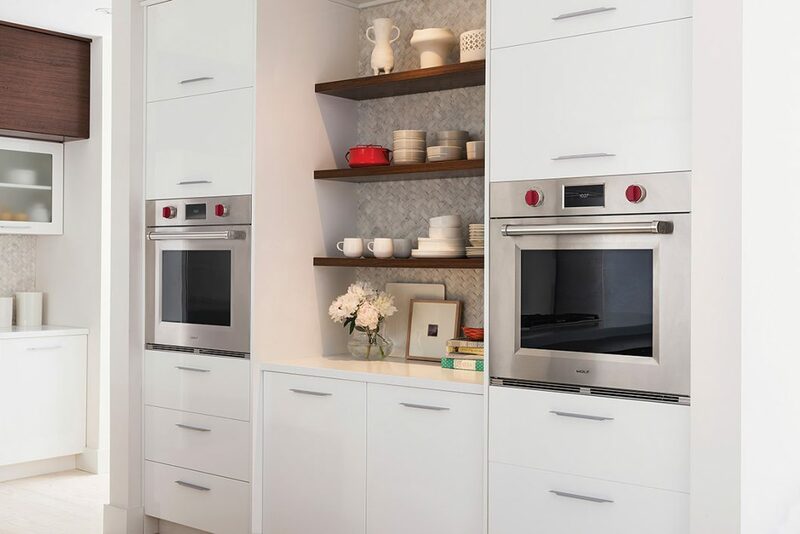 The four new distinct styles of the M series ovens give you the option to choose products that cohesively fit your specific kitchen design. Contemporary Stainless Steel: Its stainless steel handleless design co-ordinates with Wolf contemporary products, while providing a flush-inset installation option, available in single or double 762mm widths. Contemporary Black Glass: The minimalist, handle-less design, black glass and a colour LCD touch panel create a sleek look. Offered in single or double 762mm widths. Wolf’s ICBSO30PM/S/PH Professional single oven offers a 125 litre oven, with Dual VertiCross™ system, with a choice of red, black or stainless steel controls.